When you live in Paris, you tend to stick to pastry shops in your neighborhood. Not that there aren’t “destination-worthy” places in all twenty arrondissements – with many notable ones on the Left Bank and in swankier districts. But with young chefs opening bakeries in various neighborhoods, catering especially to locals, one doesn’t necessarily need to go all that far to find extraordinary pastries and confections. Cyril Lignac is a chef who is hosts popular television programs in France, and a few years ago had purchased Chardenoux bistro, an aging warhorse of a place where I once went to meet a good friend who was in town for a month. As I waited for him at the table, the place – and the waiters – looked so tired (both looked ready for a much-needed retirement), when he arrived, I quickly convinced him that we were probably better off going to a corner café for a salad. So it was good to hear that the bistro had been taken over by Monsieur Lignac and just across the street, pastry chef Benoit Couvrand was turning out stellar pastries and breads. 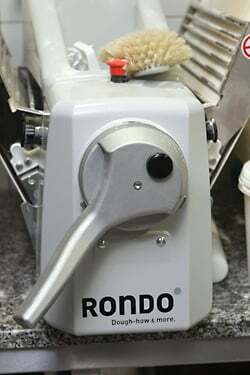 Pastry-making is a specialty and most chefs don’t know much about it, or have the time to concentrate their energy on desserts, so they hire pastry chefs who everyone knows are The Most Important People in the World. (With bread-bakers being a close second.) And M. Lignac was wise enough to hire the young Chef Couvrand, formerly the pastry chef at Fauchon, where he worked for ten years before he moved away from the fancy digs of the Place de la Madeleine. The tarte citron looks like a tasty puzzle, with carefully-piped dollops of lemon custard topped with little disks of lemony sugar. Éclairs are stuffed with gianduja, a mixture of dark milk chocolate and hazelnut cream, and macarons get dusted with fine crumbs of Speculoos, the European equivalent of gingersnaps. Morning pastries are specialties at neighborhood bakeries because, frankly, few people want to hop on a métro first thing in the morning to pick up a croissant or pain au chocolat. Fortunately for the folks who live nearby, the vienoisserie are some of the best in Paris. 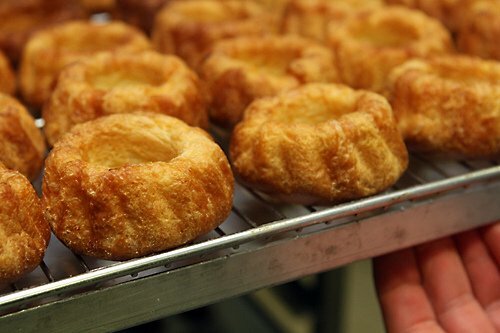 For later in the day, there are wedges of flan, a popular snack in France (not to be confused with Mexican-style flan, the reversed custard baked in caramel-lined molds), which are pretty much obligatory in neighborhood places as they’re enjoyed by kids stopping in for their afternoon goûter, as well as a few adults. In a moment of boldness, one day, I struck up a conversation with Chef Couvrand and asked if I could visit the pastry kitchen. And when I arrived a few days later, the chef and his staff were working on Babas (yeast cakes), which were trimmed then left to enjoy a leisurely soak while bobbing in dark rum syrup. 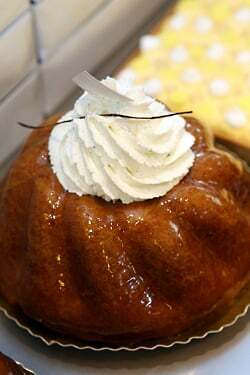 Each ring of golden cake would eventually get crowned with a plume of crème chantilly, cream practically whipped to order, then whisked out to the bakery case. Equally impressive were the breads, and the chef told me that on weekends they sell over a thousand loaves of bread and eight hundred morning pastries per day. When I visited the small bread baking area, and saw what they turned out, I felt that I could never again complain about working in my tiny kitchen back home. From mammoth pain au levain to slender baguettes, each loaf was cooked to a crackly finish, bucking the trend in Paris for baguettes pas trop cuite (not too cooked). The first bread baker arrives at 3am each morning to start the mixing and kneading and whenever I see how hard bread bakers work, I realize what a bargain each loaf of bread is. And how happy I am that I never became a bread baker. When I left, I bought a loaf of pain aux céréales and one of his stellar croissants, which didn’t quite make it all the way home in my bike basket, as I couldn’t help ripping off the crispy tips and eating them while navigating traffic. Which probably is a little dangerous and makes me wish I lived closer to the bakery. But it’s not all that far, and something tells me that I’ll be a regular – and the extra pedaling to get there means I can eat more once I arrive. 2:45 AM, NYC.. All I have at this hour is McDonald’s… Darn !! Oh my goodness! These pictures are absolutely beautiful. I wish I had the time to play with pastries. This post makes me want to open my own pattiserie in tragically patisserie-free New Zealand! Every time I talk to family back in the states, they ask me if I make my own bread here in France. I always contemplate it then remember I can shoot out and get great bread in 2 minutes with out the hassle and support our local boulangerie at the same time. Win-win! Will have to try La Patisserie the next time I’m in Paris. This is so refreshing! Here in Munich there is currently a big scandal because of the quality and hygiene at a big industrial bakery that supplies much of the city with bread (Müller bakery). 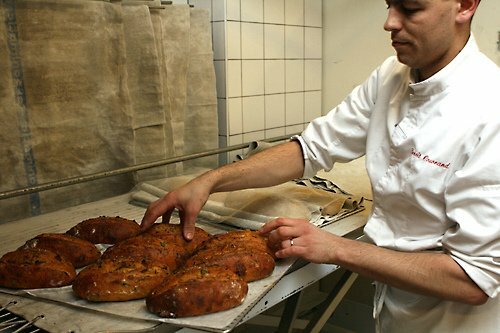 Unfortunately most bakeries in Munich are large and not much is made by hand anymore. I think there are only about three (!) 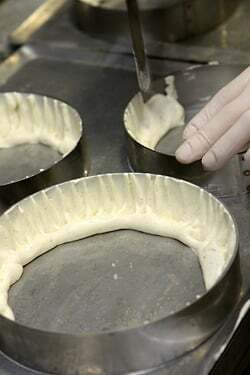 bakeries that produce hand-made quality. This is so sad in a country known for its bread. So more cheers to the French for keeping up their traditions, especially in times like these! I get the impression that, though things are changing all over, the French still find the time and have the taste to go that extra mile for good food. Thanks, David, as usual a beautiful post. I feel lucky to have a bakery on the corner but nothing compares to those photos. What’s the guy making in the rings with those sheets/rolls of dough? I agree, I’m really curious about the pleated-effect pastry being made in the rings. Does anyone know? 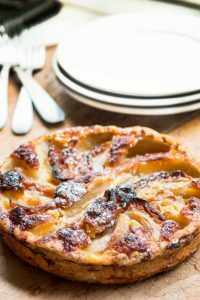 La tarte au flan sur une des photos avait l’air fameuse! Why do the french, parisians in particular, insist on using “franglais” and consistently add “by” to so many brand names? Poor taste in my view. It sounds very “Johnny Hallyday” if you ask me…. Are you still getting your “crack baguette”? And you are very right to remind readers that they don’t need to cross town for the “best baguette”, there’s small treasures hidden in every neighborhood, it’s up to us to discover them. Great, know I want a croissant. If I keep reading this blog I’ll never get back in my bikini. I hear you about the good neighborhood bakers, we are very lucky in that respect that we a stellar baker in our tiny village. What beautiful pastries and croissants! 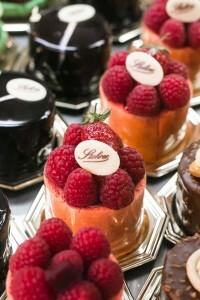 Will definitely have La Patisserie on our list for this year’s trip to Paris. 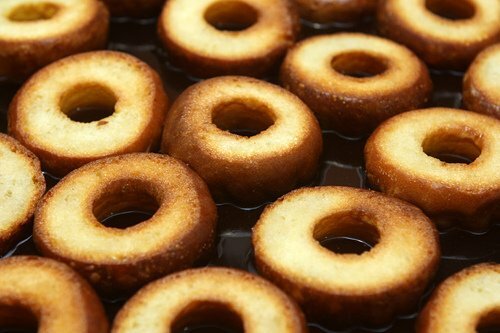 Question – What is being prepared in the cake rings? 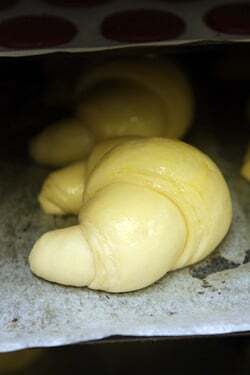 It looks like a perhaps a bisquit or japonaise batter being pulled up the sides. Interesting technique. Well, here in rural France, I and many of my neighbours, do make our own bread (and brioche, and choux pastry), partly by choice, mainly by necessity, as the one and only baker in the village, 3km away, is unfortunately known for the low quality of the bread he sells. Besides making my own, the only options are either to bulk-buy every week and freeze, or to drive a 20km round-trip every day for two baguettes! Many who live in French towns and cities have a choice of bakeries and pâtisseries, but the same cannot be said about those living in the rural parts of France, where the opposite is closer to the reality. David, that looks wonderful! Having travelled extensively around France, not all baked goods taste as nice as they look (not the case here, I’m sure!) Certainly in Paris I bought what looked like a wonderful strawberry tart only to find it tasteless. However, I love to make my own breads, cakes, cookies and croissants and the house smells wonderful when I do. For those who can’t get decent breads,there is a quick method. (I’m not sure if I’m allowed to name the book, David?) The premise is that you can stir (literally, no kneading) a dough together, rest it for a couple of hours and leave it in the fridge over night. Then, when it suits you, take out a dollop, shape and bake. The rest can be left for several days, till you need some more. I’m not kidding, using this method, I had a couple of baked baguettes on the counter in just less than an hour this morning! Wow! So many great places to eat, I’ll have to make a huge list when we travel to Paris at the end of March.Hope “La Patisserie” is close to our Hotel in Bastille- Le Marais!Thanks again, David for your tasty photos. 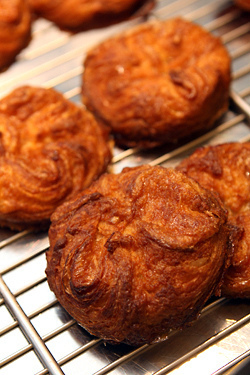 The untrimmed babas look like round crullers. 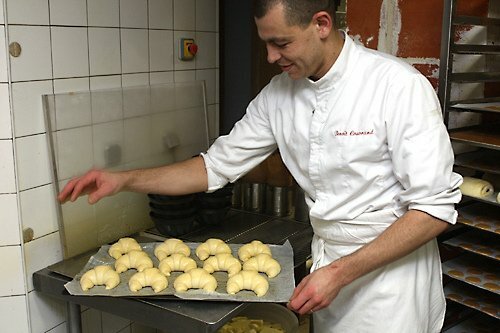 David, do you remember when you jealously guarded the name of your favourite boulangerie because of the bread you craved? You didn’t want to let the peasants know because you were afraid they would sell out and not have what you wanted when you got there. The bakery closed. Wonder what your views are on that now? Just returned from the supermarket (US) with a so-called baguette which so clearly does not live up to that glorious photo of a baguette in your post. No bakeries in my area, but then even if there was they wouldn’t have access to the variety of ingredients or the skills of a Parisian boulangerie. this looks wonderful and cozy…btw, what is the favourite bakery in YOUR arrondissement? merci for the beautiful pictures! My Paris withdrawals brought me to this blog and the first thing I read is about mon chéri Cyrill! Will definitely visit just for a chance of seeing him, really! La Pâtisserie will be another one of my stops when I visit Paris soon! 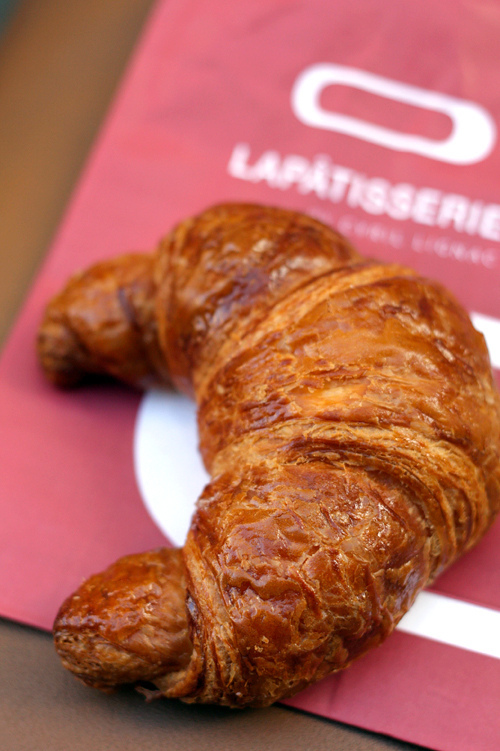 The photos of croissants are killing me…and it’s too early for lunch now in NYC. Jimbo and Annie: I don’t recall what those were, but he was working pretty hard at getting each one just right. Catherine: Fortunately the people who took over the bakery when the older couple retired are doing a great job – I love their croissants and their baguette! 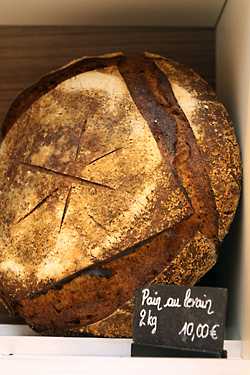 Lost in the Lot: It’s unfortunate how hard it is to find good bread in rural parts of France. But the bread in Paris is normally pretty good-to-great. I think young people who live in the countryside probably grow up and want to move to a city. A friend told me about a rural baking school in England that was teaching young folks there how to make bread so they could open in the countryside. PS: I used to wonder why bread machines were somewhat popular in France, until someone told me that they also had a hard time finding good bread outside of the cities. Dearest David – Thanks for posting this the day I started my diet – LOL!! The opening picture of the pain au levain brought tears to my eyes and a desperate yearning to have one sitting in my kitchen – fresh – with a cup of coffee and salted butter spread thickly over it. Ahhhhh. Thank God, Eurotunnel had a special on and for a mere £22 round trip ticket from Folkestone to Calais, I was able to make the holy pilgrimage across the channel to restock last week. Definitely patisserie to visit the next time I am in Paris. 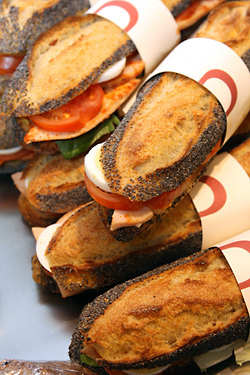 Even the sandwiches look divine! Thanks for the story, David. Might swing over there for the pain aux céréales! 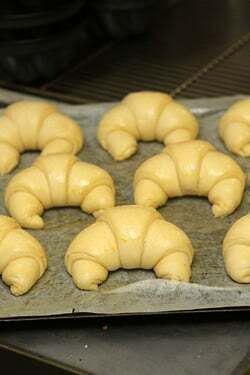 Craving a croissant with raspberry jam and a fresh crisp baguette as well! David, I totally agree with you regarding no-knead…. 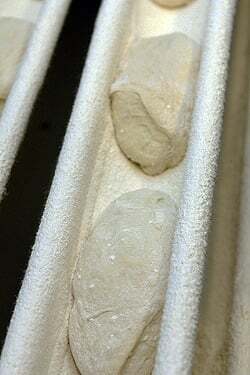 Kneading is the most enjoyable step in regular bread-baking, and takes no longer than retrieving some portion of cold sticky dough from a space-waster bucket in the fridge, and return the remainder, shuffling other items around, etc. It’s years since I visited Paris, but the photos bring back the unique aroma of a Parisian patisserie – there is no other smell like it in the world. When did La Patisserie open at that address? The Google street view shows another boulangerie. tim: They opened in November of 2011. Dee: If I get a sandwich, I usually stick with jambon-fromage – I’m kinda picky about tomatoes (because I’m from California!) and they usually don’t use the good ones on les sandwiches. Also I try to get sandwiches from good bakeries since they use better bread – like here. Stephanie: I don’t know that much about him, but Benoit is clearly in charge here and is a rather accomplished pastry chef. 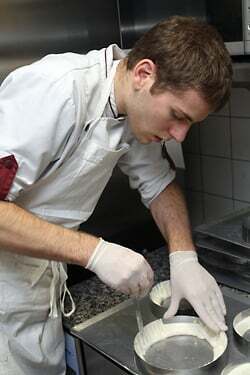 (I did read that Cyril Lignac has experience in pastry.) One thing though that I have to give him credit for is for resurrecting a faded bistro. So many of them have been bought out, then turned into money-making machines. I haven’t eaten at Chardenoux so can’t comment, but they do have an Aubrac hamburger (€22) with fresh rolls made at La Pâtisserie. I don’t know what the guy working on the rings is making either. But I’m glad you took the picture! It is wrong that I’m actually starting to drool a bit? I credit your wonderful writing and my memories of the breads and pastries I had when I went to Paris. Thank you David for your blog! I’d tried the no knead (from The Times?) a while back, but did not have much luck. The only reason I tried this other one was because it is so cold in my kitchen that I could not get the timing right on traditional methods for baguettes without being up half the night. (As someone who makes her own croissants, I’m obviously not afraid of the effort involved). The flavour should improve with the time the dough rests in the fridge, although it was still passable on day one. 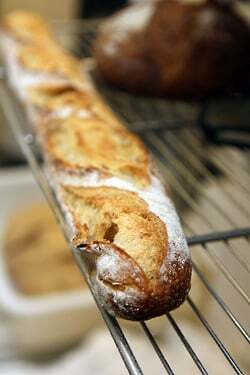 It may not be perfect but for those without access to decent bought baguettes, it is an alternative. When things warm up a bit, maybe I’ll do a side by side test! So. Much. Respect. I don’t care if it makes me obviously Canadian, I will continue to smile obnoxiously and give my mille mercis to my local pâtisserie every morning. I am immediately telling my friends whose residence is in the 11th about this new one! Ugh. Jealous. They have Blé Sucré too. BUT I am right off Mouffetard… and I do love the organic Boulanger de Monge. No complaints :-). I chortled/moaned at the description of the dark milk chocolate hazelnut eclairs. I think of milk chocolate as greasy sweet tastless stuff – but I might try some of the dark stuff. To think you can walk into a bakery and just start choosing. Wonderful post. 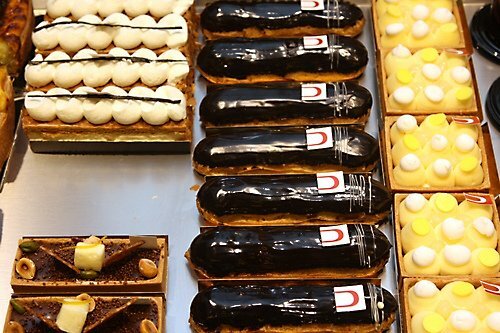 If one spent a month in Paris, do you think “one” could cover all the good patisseries? Does your app have a walking route between them so I could burn off the calories between? There’s a boulangerie on the ground floor of my building — I could sneak in the back while I’m taking out my trash. But I walk down our looong block to another boulangerie, because the breads and patisserie are SO much better. And people *still* stand in the line in the one in my building!?! I always think what don’t these people get? I’m not even French, and it only took me one try at each to figure out which one is light years ahead in terms of quality! I have a great book for no-knead bread: ”Pain” by Judith Fertig. Hope you can find it. It is readily available in Québec. As Sandra says, an overnight in the fridge does improve flavour. This is a wonderful post now just send me the croissant! you most wonderful David bringing up the essence of that very unbeatable Paris magic. I should immediately buy a train ticket and go to that bakery, this looks all so good, just as I love it. I love a good, crispy baguette. None of this pas trop cuit for me. Your photos in this post are amazing. What are those round things (being dipped or extracted, not sure which) in caramel? 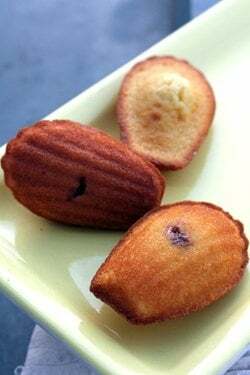 There ARE little bags of madeleines sounds so much better, non? 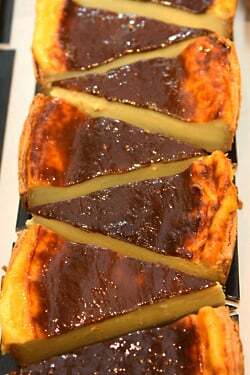 Where can I find the recipe for the French flan? As I was reading the last little bit of the post I thought ‘riding there is good, you earn your pastries.’ We must think alike! I’d love to try some gianduja. It sounds amazing. Oh how I wish there were little shops like this in Brisbane, Australia. These photos made me audibly sigh and internally swoon. I made my very first batch of croissants a couple of weeks ago and while they turned out okay (especially for my first time!) they actually turned out similar to the Tartine Bakery croissants…which is to say that they were large and slightly tough/crispy rather than pillowy soft, flaky, evenly baked and buttery (which is what I imagine the one in the above shot was like). They were tasty but the texture was just not idea. Any chance you’ll do a croissant tutorial someday for those of us who have to suffer through life in the States sans boulangeries? Pretty, pretty, oh so pretty. Every. Last. One. I have always imagined choosing places to eat in Paris (particularly desserts and morning pastries) would be near impossible. I bet the possibilities are overwhelming. I enjoyed your review – one of these days I will venture to Paris and stop at la Patisserie first – everything in the photographs looks delicious…and of course warranting of an extra mile or two on a run post-consumption. You must feel like a very lucky man every day! You had me with the first photo! Dang – what a beautiful croissant! When I lived in the 10th a few years ago, I would go down to the closest bakery for my morning fix. Then I realized the place 1/2 block away was better! But I only found that out when my “regular” closed for Christmas vacation. (The long explanation from the owner, which I could only partly understand, was classic). your first paragraph is the reaosn that i love and miss paris. thanks for the great post and taking me back there! After working for a bakery for two years I am still surprised that bread prices are so cheap, yet we would get up at 3 am to start the whole process. Last time we were in Paris we took 2 metros just to get to Pascal Pinaud’s Boulangerie for his amazing croissants and baguettes! 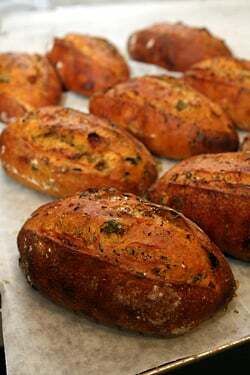 It is sad that the United States does not have the tradition of these wonderful breads that Parisians are able to take for granted. David, I know exactly what you mean about the local bakery. I stayed at the Mama Hotel with some family last year for a five-day Paris trip and we frequented this wonderful bakery a block away. We’d stop by every day because my sister became addicted to their almond croissants (haven’t found an equal to them stateside), and their tarts were tiny, beautiful, and delicious. Sometimes a cat would stand at the door and while people walked in and out with their long baguettes and the image was so perfect that I questioned whether I wanted to return to the U.S.
Gah! So envious. The city where I live has something even worse than “not enough good bakeries”: it has only terrible ones, crowding the streets and clogging the neighbourhoods. The two major markets? Sell the same bread cranked out at factories for sale at supermarkets. And, the half-dozen or so “ok, just fine” quality bakeries sell their wares for such staggering prices that it’s impossible to not feel swindled. I know what goes into making something really good-tasting, and how pricey it can be to mass-produce things that keep fresh only one day (or which begin to stale the moment they hit the racks). But sheesh! Sheesh! If what you bake stinks, then go into banking or real estate instead. I’ve simply cut bread and dessert and pastries and sweets out of my diet, except for days when I have time to make it myself at home, or occasions when I’m lucky enough to be in another city. These photos along with your post are like my pastry dreams! These pastries are positively killing me right now! So beautiful and tasty-looking, I am green with envy! Thanks for reminding me of La Pâtisserie, David! I had planned to go there a little while ago and then forgot. Anyway, I made the trek today and treated myself to some of their goodies! 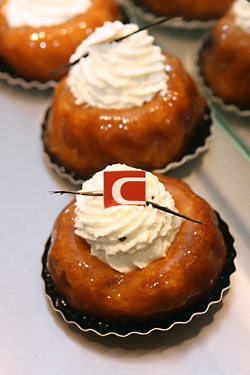 La Caraibe was very good, Baba au Rhum is still waiting to be enjoyed tonight after dinner. The only downside was that when I asked if I could take a couple of photos of their beautiful creations, the girl at the caisse said it would be fine but as I proceeded to take the pics, another girl came out of the kitchen and yelled at me that it was interdit!!! Always amazes me when people don’t realize that I was offering them free marketing by posting beautiful photos of their products with favorable comments on my Facebook and blog. Instead they spoiled my experience and I have to conclude that while their products are great, I might be more inclined in the future to visit another patisserie where the owner knows that talent and products are just part of the success and that it is also important part to hire and train pleasant sales people. I know it’s Paris and people are notorious for being rude but there are patisseries here that get the importance of politeness to customers. So it can be done!! Hugo & Victor, for example, has the most pleasant sales people in my opinion. Anyway, it was still a treat! Another gorgeous post! Man those pastries are beautiful. Erelin: A number of places in Paris don’t allow photos – like Ladurée or La Grande Épicerie – for reasons similar, I guess, to why supermarkets in the states like Whole Foods and Trader Joes don’t allow photos (from what I remember). I got yelled at in London at a coffee shop, even though I asked before I took a picture and one woman said it was fine, and thanked me for asking. Then her co-worked came over and started screaming at me afterward. In Paris, taking photos is often chancy for reasons that I sort of understand (people are working and those places are there to serve customers and do business) and reasons that I don’t understand (they should be happy we’re sharing what they do with the world.) I always think that instead of irking customers, they should just post a notice on the door that says something along the lines of, “We appreciate your interest in our establishment, but in order to preserve the atmosphere, we request that you refrain from taking pictures and experience the pastries”, or something like that. I always ask (which one should always do in Paris) and in this case, I asked the chef directly if I could come back with a camera, and he said yes. But perhaps someone from the bakery will weigh in here about your experience because I do think the chef is doing wonderful things and I’m happy to direct readers there to enjoy his excellent pastries and breads. I want the croissant and at least one of those pastries right now!!! Actually, it’s probably very good for my waist line and my arteries that there is a very large ocean between me and that bakery. I feel so conflicted! I love posts like this. Thank you! What I forgot to say is that I love the behind the scenes! 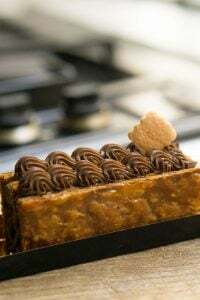 I am so flippin excited to try La Patisserie in April! I recognized the baba’s instantly. My childhood favorite. I’d greedily inhale them. Living in L.A. as a child, my father found a French bakery and would regularly bring home big pink cardboard boxes full of delicious pastries. I remember the napoleons and the baba’s, both of which were delectable. 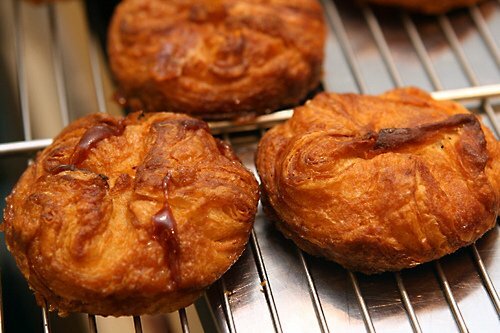 I haven’t stumbled upon pastries like the ones I remember in my childhood. Oh, how I’d love to devour them now. Thank you for the pictures! As always, thanks for sharing your discoveries. To comment on M. Cyril Lignac, he trained as a very young chef with some of the best & well-known chefs in France which I don’t think will be possible if he doesn’t have the talent at all. He also trained under M. Pierre Herme so he did have the pastry background. His first TV stint with M6 involved him training some out of school kids so they could work in his restaurant thus giving them another chance in life. I just happened to see how he started and I think you’re wonderful in giving credit to whoever deserves it. Thank you for your response, David. It makes a bit more sense to me now. I just hadn’t had that experience here yet so it shocked me mildly. So far I’ve been greeted with permissive smiles at my requests to take photos. 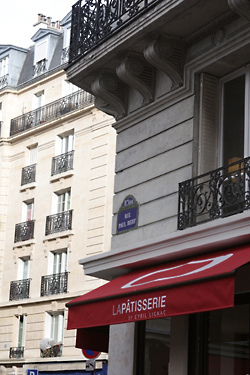 We just left Paris a few days ago and we were staying about 20m away from this patisserie. We planned to try it on our last morning(Monday) and it was closed, c’est la vie. We’re back on the 29th for 12 hours, perhaps we’ll make the trip from Gare de Lyon, as the flan looks amazing. Strange, the logo, and the name are eerily similar to Patisserie des Reves…. but not nearly as beautiful (though probably not as expensive). Looks delicious, though! If you haven’t seen it already, I’d recommend watching Kings of Pastry, a fun documentary about the Meilleurs Ouvriers de France (MOF) competition. No doubt French pastry is serious business! Mouthwatering post, as always. Question…in the 6th photo set on the top left, there are rings lined with what looks like dough. What are these used for?